My rant of the day is that I’m struggling to understand why Google is not either penalizing website sites that do not provide a mobile version of their website, or rewarding websites that do? This weekend I found myself annoyed yet again with Google’s search results while searching on my phone. I am really tired of surfing the web from my mobile device only to be presented with 10 of the slowest loading, fat bellied, ad riddled authority websites on earth. I want to see mobile friendly results when searching on my mobile and find what I need FAST. Waiting for these bloated outdated sites to load delivers an awful user experience, and that’s what Google is supposed to be making their number one priority. 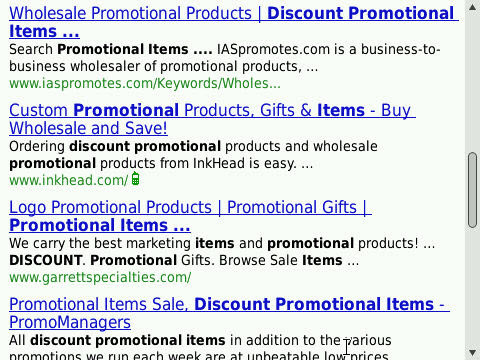 Even within Google News results, you find these traditional ad heavy websites are the ones that often appear. It’s maddening, sluggish, and I end up giving up before I find what I was searching for. We know Googlebot can decipher the difference between a mobile website and a traditional website. I realize that in the beginning, the mobile search results will suffer, as many websites have not been provided the encouragement to create a mobile website. But I think the time has come. If you would like to see mobile search results on your desktop, all you need to do is to go to http://www.google.com/m and you can see what the search results look like on a mobile device. Google, we all appreciate your efforts to take over the world, with your Android OS, Chrome OS, Chrome Browser, Google Radio among the many other market segments your actively jumping into with both feet. I think you need to circle the wagons here and make sure your core business is tidy before you keep going into new markets. You never know someone may be cooking up a mobile browser (like http://www.skyfire.com/) or better yet a mobile search engine in the background. Why isn’t Google delivering mobile friendly results? Cindy Krum discussed mobile search results here at SEOMoz, the talk about Google having two separate indexes for mobile and traditional search. She makes the point about how bad the results are when Google only provides mobile results. But I am not sure the results are any better when provided with several really big slow websites that take forever to load, and are nearly impossible to navigate or find what you were looking for. Whether Google needs to maintain a separate index or have a difference in the algorithm is debatable, but I think this should be changed sooner rather than later. Once mobile websites are rewarded in mobile search, obviously more companies would get their sites mobile friendly. Google does need not exclude non mobile results, but possibly just tweak their mobile algorithm; doing something as simple as say for any query, run trhough the top 20-30 results which are traditionally fairy relevant, and if any of these results have a mobile website, show these website higher. No rocket science required, just a little common sense. It is unusual that Google is not rewarding the online businesses that have embraced mobile search and even providing a great mobile website with the appropriate search engine optimization for mobile search. I really thought by May 2011, Google’s mobile search would have come further than this. Google has recently announced that Google Instant Mobile is now available “globally”. This means that the tool is released for all countries that have Google Mobile access (there are several dozens of those) and supports almost thirty languages. The product, similarly to Google Instant Mobile, is integrated into search features for any Android browser (built-in for Android OS 2.2 and up) , and features various algorithms that allow faster dynamic search results. Although this release was expected (shortly after releasing Google Instant Mobile in English, the company had announced that international support is on its way) – nobody anticipated that this would happen so quickly. The roll-out took Google slightly over one month time – an incredible figure, considering the complexity of the product. Of course, this simply means that Google had been working on globalization of Google Instant Mobile simultaneously with the product itself. That is no wonder – Google had always emphasized the importance of international marketing and global support.